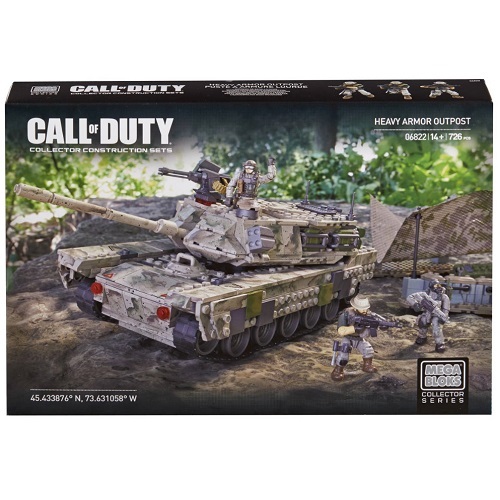 MBCOD: The Mega Bloks Call of Duty Last Pocket of Resistance: Heavy Armor Outpost [Special Ops]: is 726 pieces and contains THIRTY accessories? Do you see that down there? Add in Captain John Price, 2 more M.A.F. and the outpost and you have BA Toys! Buildable Main Battle Tank 12L x 5W x 4H inches with rotating main cannon turret and realistic tracks that really spin. Includes 30 highly detailed, interchangeable accessories and weapons like removable combat vests, binoculars, entrenching tool (E-Tool), walkie-talkie, flashlight, canteen, ammo pouch, combat knives, and more! The main battle tank of the Heavy Armor Outpost is a direct fire, heavy armored vehicle that is nearly unstoppable in combat. The main battle tank of the Heavy Armor Outpost measures 12L x 5W x 4H in inches and comes with a heavy machine gun and main cannon on a large rotating turret, and tracks that really spin. The buildable improvised outpost and the camouflage mesh canopy can attach to the heavy tank to offer protection for your troops. Captain John Price and a team of two other special ops troopers possess extreme poseability, and highly detailed, authentic interchangeable accessories and weapons that allow for mission-specific customization.